The Wichita Aero Club is accepting applications for the Edward W. Stimpson scholarship the organization announced in October of 2012. Created to honor the memory of the late President of the General Aviation Manufacturers Association and ICAO Ambassador, the scholarship is being administered by the Wichita Community Foundation (WCF), a 501© (3) organization, where a Wichita Aero Club Scholarship fund has also been established. The Aero Club plans to provide at least one award annually for students who seek to make a significant contribution to the aviation industry upon completion of their education. The $2000 Stimpson scholarship will be given to a student who has completed at least 50% of the required credits for a certificate, associate’s degree, or a bachelor’s degree at an accredited educational institution and has demonstrated an interest in pursuing a degree and/or obtaining professional certification in an aviation-related field of study. The number of awards made each year is expected to increase as the scholarship fund grows over time. The scholarship underscores the Wichita Aero Club’s commitment to aviation-related education. Applications for the WAC Stimpson Scholarship will be accepted through March 15 each year, with the winner to be announced before the WAC Golf Classic which takes place in June. The Wichita Aero Club has posted a link on its website to the Wichita Community Foundation’s scholarship site where prospective applicants can obtain guidance on how to apply online. The Aero Club will also work with the WCF to facilitate the distribution of scholarship information through such organizations as the University Aviation Association and other networks associated with institutions of higher education. “It’s our intention to expand our reach as much as possible by utilizing a broad range of communication channels to generate solid and continuing interest in this scholarship,” Mr. O’Leary noted. Ed Stimpson, the long-time GAMA President and ICAO Ambassador was “a true friend of aviation education, and a former Board Member of Embry Riddle Aeronautical University. ERAU has a branch in Wichita, located at McConnell Air Force Base and, “even though Ed was not from Wichita…or even the local region, his impact on general aviation and the many people who work in the Air Capital was significant. He, along with Russ Meyer at Cessna, helped spearhead the effort to pass the General Aviation Revitalization Act of 1994, which helped preserve or create many thousands of jobs,” Mr. O’Leary added. During the 1990’s, Ed Stimpson was President of the General Aviation Manufacturers Association (GAMA), a post he held for 25 years; he was the face of General Aviation on Capitol Hill. 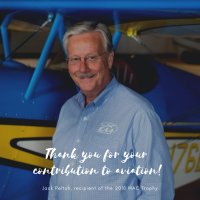 A long time advocate and supporter of aviation education, he graduated from Harvard and earned a Masters in Public Administration from the University of Washington. He also served for years on the Board of Trustees at Embry-Riddle, holding the position of chairman of the board for seven years. Ed began his career in aviation as the head of Congressional Affairs for the Federal Aviation Administration under the Kennedy Administration. In 1970, he became president of a newly formed aviation association, GAMA, and quickly assumed a leadership role in the industry’s response to nearly every significant aviation policy issue of the era, including the establishment of the Airport and Airways Trust Fund, the allocation of aviation fuel during an oil embargo, and a strike by the Professional Air Traffic Controllers Association. Following his tenure at GAMA, he was appointed by President Clinton to be the United States representative to the Council of the International Civil Aviation Organization (ICAO) in Montreal, with the rank of Ambassador. He retired from that position in 2005. “Honoring Ed and his contributions to aviation and education by naming the Wichita Aero Club’s annual scholarship is a fitting tribute to a true statesman and friend of all those who fly,” Mr. O’Leary concluded.